I love the concept of "beertails". Craft beer has so many flavors and facets and genres ... there's no way it doesn't lend itself to be incorporated in mixology! From the honeyed undertones of lagers, to the bitter variances in IPAs, the possibilities are endless for blending those tastes with well chosen liquors, liqueurs, and any other kitschy cool ingredient that may strike your fancy. Much like wines and sparkling wines have been for years (think mimosas and sangrias), beer seems to be the new fantastic mixer that's coming into its own. One of the bars I work at keeps a number of local, rotating brews on tap. I've had the opportunity to play with them as basises for cocktails (nee, beertails! ), and all have been popular with my patrons. 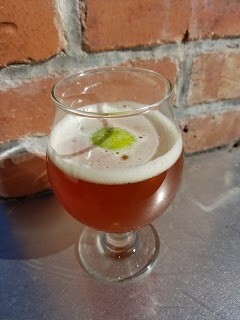 Generally, when creating a beer based cocktail, I begin by taking into account the underlying flavors in the beer I want to use. It's not just about the first taste that hits my mouth ... what are the flavors that I find in the middle, or on the back end of the experience? Those are usually the ones that I try to pair with, or intensify, with my other ingredients. Sometimes, though, it's simply about creating something I don't have on tap! Once, a customer really wanted a sour beer, so I blended fresh lemon and lime with a splash of sour mix, a dash of rosemary thyme honey syrup, and one of our pilsners on tap to create one ... he still orders it to this day. Take 1.5 oz of spiced rum, a splash of apple cider, and an orange slice, add rocks and shake. Pour into a pint glass and fill the rest of the way with your favorite winter or autumn lager. The spices in the rum and the fruit in the cider blend perfectly with this style beer, and create a wonderful frothy spicy sweet beverage. Stir together 2 oz of sweet heat tequila, 1 tablespoon of honey, 1/8 teaspoon of worcestershire, and a squeeze of fresh lime. Top with 6 to 7 ounces of your favorite honey IPA and stir again, then enjoy! This twist on the classic Michelada is a sure favorite that will compliment any Spanish cuisine, and you can add additional spice by simply adding 1/8 teaspoon of your favorite hot sauce (I prefer Chalula with this one) and increasing the honey to 1 1/8 tablespoons. The main thing to remember is that there's no limit to the combinations you can dream up and create! In the same way that multitudes of recipes for and styles of wine cocktails exist, beer has just as many possibilities as wine for drink bases. Start playing with the options and let me know what fantastic (or ridiculous ... all are valid) things you come up with!